Whew! Sweet baby jeezup, I really wanted to like this book but lawd, I see that I can’t even finish it and where am I? *let me check*…hmmm, 25%...chapter 7. You know what it is? I don’t like this chick. The main character, hell we haven’t even gotten to her HEA and I just don’t like her. That’s right, I said…I don’t like H.E.R! lols. 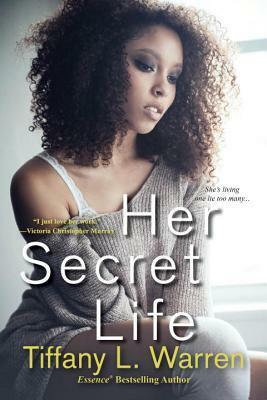 Her Secret Life starts off with Onika Lewis getting hit on by I assume will be her man by the end of the book (but again I didn’t finish this). But she turns him down because she is homeless and then the books takes you back to the past which is giving you background on how Onika ended up at this point in her life. This should have been a good lead up to take you into the present and the start of what would be a new relationship right? But oh, no…the author decides IMO to spend way too much time in the past. Because I bet my sweet booty, that by the time I got to the present where Onika has met her “forever”, I would not have cared one damn bit…not a one. So what was my issue you ask? Firstly, I had some issues with some of the wordings in Her Secret Life. All I’m going to say is we have to stop with the stereotypes as well. Because when we tell our own stories, they can at times be problematic too. Mainly, as I said I was not a fan of Onika. Oh, yes she was a ball of contradictions but it was annoying. I want to chalk these failings up as Onika being young and coming from a bad place. BUT for all this characters talk of not “ending up like her family”….well…. 25% into Her Secret Life is enough for me and there are sixty-two chapters! Bish…you know what? No, not this time around Gawd! I don’t have that kind of time, I mean I do but there are too many books in my “Bish we just sitting here” pile for me to be all frustrated and irritated with one. So I must move on. But hey, everything ain’t for everybody...right? So what I didn’t like you may love. I'm sure there are some folks that love Her Secret Life but I ain't one of em. I will have to try another book by Ms. Warren. Sometimes you need to just let one go by the way. When I start to strongly dislike the main character, there is very little chance of a recovery for the book even if I finish so I think you made the right call there. Moving on to something you will enjoy.